Former President Laura Chinchilla Miranda is a political scientist. She also holds a Master in Public Polcy from the Georgetown University. She was elected President of the Republic of Costa Rica on February 7, 2010, for a constitutional term of four years. She is the first Costa Rican woman ruler of this country. Her election as President of the Republic of Costa Rica was preceded by a successful political career which began with her appointment as Minister of Public Security-been the first woman to hold that position-between 1996 and 1998. While in that role, she also served as President of the National Immigration Board and the National Drug Council. Between 2002 and 2006 she was elected member of the National Congress where she chaired the Committee on Legal Affairs and the Committee on Narcotics. In 2006 she was elected Vice President of Costa Rica, assuming office as the Ministry of Justice at the same time. Finally, in 2010 she conquered the presidency of the country. During her years of public service she highligthed the promotion of various policies regarding citizen security, including the professionalization and modernization of the police, the reform of the criminal and criminal procedure codes, the adoption of laws against drug trafficking and organized crime, and diverse modalities of citizen participation in preventing violence. One of her most outstanding achievements in the exercise of the Presidency of the Republic was the steady decline in major crime rates in Costa Rica, including homicide and femicide. Mrs. Chinchilla also prompted measures on institutional reform of the Costa Rican government, on digital government, on the promotion of the rights of women, on the protection of children and on environmental sustainability. Her efforts in the latter area, especially in the protection of the seas, earned her two important international awards: the “Excellence in National Management of the Ocean” Peter Benchley of 2011, and the “Award of the Shark Guardian of the year “in 2013. 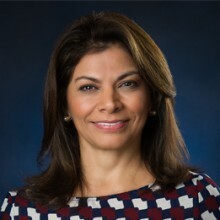 Along with her public career, Mrs. Chinchilla Miranda dedicated part of her professional career to the international sector. She has worked as a consultant in Latin America and Africa with various international organizations in the area of institutional reform, with particular emphasis on judicial and public security reform. Relevant tasks performed include diagnostics on the justice sector for the Agency for International Development (USAID); coordination of studies and projects on judicial reform for the United Nations Program for Development (UNDP) and assessments and advice on police reform to the Inter-American Development Bank (IDB). She has lectured at various forums and has several publications in both Spanish and English on topics related to the administration of justice, public security and police reform. She holds Honorary Doctorates from the University for Peace of the United Nations, Georgetown University, and Kyoto University of Foreign Studies. As former President, she is active on global agenda issues being part of various forums, such as the Club de Madrid, the Inter American Dialogue, and the Latin America Presidencial Commission. She is inviting professor at the Government School at the Instituto Tecnológico de Monterrey, were she is leading the Latin America Class on Democracy and Citizenship, and at the McCourt Public Policy Institute in Georgetown University.